The T-2's configuration was clearly reminiscent of that of the two-seat Jaguar, with the two aircraft having the same overall configuration and some resemblance in details. In particular, the T-2 was also powered by two Rolls-Royce Turbomeca Adour turbofans, the same engines used by the Jaguar, license-built by Ishikawajima-Harima Heavy Industries under the designation "TF40-IHI-801A". Despite this similarity, the T-2 was not a copy of the Jaguar, and the two aircraft could be distinguished at a glance, the T-2 having a more dartlike appearance, being noticeably longer and having a distinctly shorter wingspan than the Jaguar. The T-2 also had many detail differences. For example, since the JASDF had no rough-field requirement, the T-2 had conventional single-wheeled landing gear and not the distinctive heavy duty landing gear of the Jaguar. The T-2 was made mostly of aircraft aluminum alloys, though it featured selective use of titanium. The high-mounted wings had a leading edge sweep of 42.5° and a 9° anhedral. The wings feature noticeable "leading edge root extensions (LERX)" and full-span leading edge slats, with a "dogtooth" discontinuity on the outer edge of the span, though the dogtooth did not split the slat. There was a single ¾-span flap on the trailing edge, unlike the full-span double-slotted split flaps of the Jaguar, but the T-2 did have twin spoilers on each wing just forward of the flap for roll control instead of ailerons, another element clearly derived from the Jaguar. There was a small fence mounted inboard on the top of the wing. There were no fuel tanks in the wings. The tail assembly was conventional, featuring slab all-moving tailplanes with an anhedral of 15°. The steep anhedral kept the tailplanes out of the engine exhaust while allowing them to remain effective through the wing wash. Like the Jaguar, there was a fixed ventral fin under each exhaust, while two hydraulically operated airbrakes are fitted just forward of each ventral fin. Each Adour engine provided 22.75 kN (5,115 lbf) max dry thrust and 32.49 kN (7,305 lbf) afterburning thrust. The TF40-801As did not have the "part throttle reheat" feature added to Adour 102s as an engine-out safety feature, and the T-2 was never refitted with more powerful Adour engine variants, along the lines of the Adour 104 eventually refitted to British Jaguars, leaving the T-2 somewhat underpowered. The engine intakes had fixed rectangular geometry and fuselage splitter plates, plus a set of spring-loaded auxiliary inlets behind the intake lip for increased airflow in ground running. There were large service doors beneath the fuselage that provided excellent access to the engines for maintenance. The T-2's tricycle landing gear all featured single wheels, with the nose gear retracting backward and the main gear retracting forward into the fuselage, rotating 90° to lie flat, and incorporated an antiskid control system. The nose gear was offset slightly to the right, with a small fixed vertical airfoil mounted in front of it to compensate for the extended nose gear's tendency to cause yaw. A runway arresting hook was fitted under the tail behind the engine exhausts. A total of 90 production T-2s were built, including 28 unarmed "T-2(Z)s", or "Zenkigata (early type)" and 62 armed "T-2(K)s", or "Kokigata (late type)"; some sources translate these variants as "T-2A" and "T-2B" respectively. An additional two T-2(Z)s were built but modified for the S-FX / F-1 strike fighter program. The last T-2 rolled off the assembly line in 1988. The T-2 service in 1975, with the first unit, the 21st Hikōtai becoming fully operational on 1 October 1976, with a second squadron, the 22ndHikōtai following on 5 April 1978, allowing the North American F-86 Sabre to be phased out of the advanced training role. The "Blue Impulse" aerobatic display team of the JASDF re-equipped with the T-2 in the winter of 1981–82. T-2s were also used by a dedicated Aggressor squadron, being replaced by the McDonnell Douglas F-15 Eagle. T-2s were also used as conversion trainers for squadrons operating the Mitsubishi F-1, a development of the T-2. The T-2 was retired by 2006, being replaced as an advanced trainer by the Kawasaki T-4 and as a conversion trainer by a two-seat version of the Mitsubishi F-2, which had replaced the F-1 in the anti-ship strike/ground attack role. This is a kit that Hasegawa released as soon as the design was finalized. They correctly realized that Japanese aircraft will sell very well in the home country. The kit's age can be seen by the raised panel lines, but the molds certainly do not show it. The only flash I saw was a tiny bit on the sprues. Hasegawa also includes all the bits to do the single seat F-1, but you'll not be needing those for this boxing. You get a one-piece cockpit tub to which the nose gear well is attached. 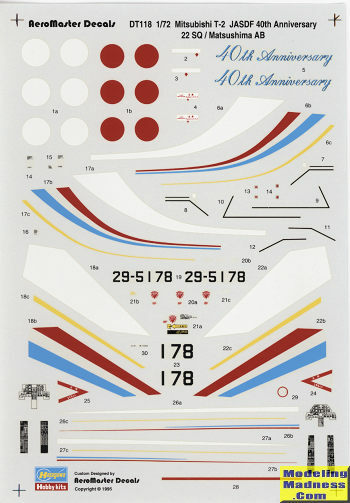 Decals are used for consoles and instrument panels. Each seat is three pieces and you are provided a crew member for the seat. The back of the seat includes the piston to hold the canopy open so if you are doing closed canopies you'll need to cut those. Though no nose weight is shown and may not be needed, I'd put in a few grams just in case. Intakes are two pieces on each side and shallow as is often the norm. You may also need to cut the fin tip antenna as the T-2 did not have one. Instructions also have you cut the wing tip missile rails, as these were generally not carried. Since it has a single piece wing, you'll have to decide whether or not to fill holes in it for pylons. While the T-2 was seen with inner wing tanks, the outer pylons, like the wing tip rails were rarely used. I looked at a lot of photos via Google and never saw either of these being used. . Landing gear are nicely done with the usual ejector marks in the inside of the wheels. You are provided with separate speed brakes and actuators, and it would not be unusual to see them bled down on parked planes. More often than not, the large main gear doors were closed, but again, could be modeled lowered and not be non-prototypical. Don't bother with the centerline rack as no photos showed this installed. Instructions are standard Hasegawa of the time, providing Gunze paint references. There is a very nice, full size Aeromaster sheet for this special scheme with an addendum sheet for placement. Basically, paint the plane grey and apply the markings. The T-2 and its single seat sibling, the F-1 don't get much love outside the home country. It is too bad as it is a very nice looking aircraft and thanks to special schemes, has a number colorful options. These kits are not impossible to find and are often quite reasonably priced. You should seriously check one out.